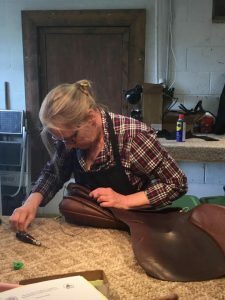 As a Qualified Saddle Fitter through the Society of Master Saddlers, U.K. , I have been an Independent Saddle Fitter for over seven years; studying directly with the Society of Master Saddlers for the past five years. "As the most influential professional body in the world connected with saddlery, the Society has put enormous effort into improving saddle fitting standards including instituting what remains the only Non-Commercially linked Saddle Fitting Qualification in the World. The qualification has been approved by City & Guilds / NPTC, a UK qualification awarding body, and is recognised by equine vets and physiotherapists and other professionals working in the equestrian industry. The Society is proud of its reputation for expertise, high standards and integrity." Being an Approved Retailer for the Society of Masters Saddlers, U.K. allows the Shop to be registered Sellers for Baines, Black Country, Fairfax and thier lines of Kent & Maters, Thorowgood & Lovatt & Ricketts. 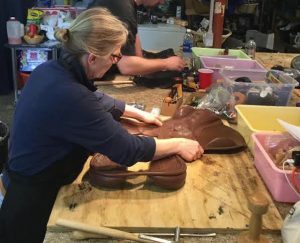 I am also the Connecticut and New York Representative for Amerigo Saddles. I have been associated with the Bates/Wintec lines for over 7 years. These resources provide a selection for widely varying conformations and Rider preferences. Our Saddle Fitting service begins with obtaining detailed history, establishing baselines of weight & condition, assessment of conformation, high/low heel, shoulder/ hip asymmetries; undertake back examinations and locate asymmetric development or sensitive or sore areas; evaluating of in-hand movement, identify un-level steps and hip rotations. Viewing the movie banner on our front page, are you able to detect any asymmetries? Either your saddle or samples provided, client will be under saddle, walk, trot, canter as well as jump, if authorized, for both reins. Static tracings will be taken. To make a saddle fitting appointment, please complete the inquiry today. If available, please attach photos of your horse (square) noting side conformations and hind end coming into shoulders- best taken standing upon a stool, allowing for sufficient height. As I am off property several days a week, I kindly ask to please allow up to 48 hours for response. Thank you. Our Services and Fees are listed below; Please Email to schedule an appointment or request a service! Are you experiencing any issues that have been affecting your riding or balance? Click here to complete a health and lameness questionnaire.